For what it's worth, you'll likely not see another film like COLOSSAL in theaters this year. And I can't imagine that you would want to. Kudos to writer/director Nacho Vigalondo for coming up with an original idea in this over-saturated market of remakes, sequels, and prequels. But this one needs to be tossed right into the wastepaper basket. It starts off intriguing enough. Anne Hathaway is Gloria, a young woman spinning head first into a quarter-life crisis, one bottle of vodka at a time. When we meet her, she's stumbling home to the swanky apartment she shares with her boyfriend Tim (Dan Stevens) after spending a night on the town with her squad. But before she could sober up and adjust to the bright daylight hours, her irritated lover, apparently a long suffering victim of her frequent drunken escapades, breaks up with her and evicts her in one hasty confrontation. And just like that, party girl Gloria finds herself homeless, boyfriend-less, out of options, and deliriously sober. So she does what many people in her predicament would, returns to her hometown. There, she encounters a whole new monster-size problem. Like I said, it's a stimulating premise. But it spins off the rails as quickly as Gloria's newfound sobriety when Vigalondo plops in an alien monster terrorizing Seoul, South Korea mysteriously at the same time as Gloria's unceremonious homecoming. Coincidence? Apparently not. Apparently the two instances are directly related, and maybe the monster and Gloria are one and they're somehow helping each other. Still with me? 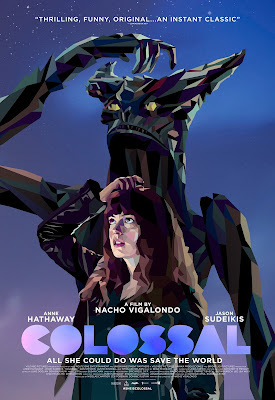 It doesn't really matter, because COLOSSAL never tries to make sense. In Vigalondo's attempt to reinvent the adult coming-of-age drama, he tacks on several unnecessary layers that add no value and needlessly complicate the story. It could have been decent had it stuck with the main plot about a woman trying to turn her life around (however generic). But a monster kindred spirit and a messy, empty reunion with Oscar (Jason Sudeikis), a high school acquaintance, makes it a head-scratching viewing experience. And not in a good way.